What is the value of a playoff win? A question has been weighing on my mind recently. It’s something most people probably wouldn’t care about, but if you’re reading this column, it’s something I think you’ll find of great interest. At least, I do. The question is, what is the proper amount of weight we should give to a player’s performance in the playoffs when evaluating his overall career? See, all the sabermetric attempts at a total value measure, such as Clay Davenport’s translations or Dan Rosenheck’s WARP statistic or Bill James’ Win Shares, consider only regular season accomplishments, even though postseason performances are arguably more memorable and certainly no less important. I haven’t seen many people point out this issue—and indeed, until recently, I considered it no big deal—but in light of Curt Schilling’s potential retirement, it’s a problem I’ve spent the past week trying to solve. Now this column won’t be about Schilling or about how including playoff data might impact other players—the latter topic is for some future column (which I hope to have done next week, but given my recently sporadic publishing schedule I can in no way guarantee) and the former I already addressed in Heater Magazine; if you don’t have a subscription or don’t want one, suffice it to say, once you include Schilling’s playoff numbers there is no way you can’t put him in the Hall of Fame. This column is only a start. Before I move into any calculations, I want to hear reader feedback and critiques, because if what I’m about to tell you correct, the implications for anyone who cares about historical valuations are pretty huge. Alright, enough with the vagaries; let’s get to some real results. But first, let’s start with a graph I printed in a column last year on calculating Pennants Added. Pennants Added, for the uninitiated, is a Bill James invention and supposed to measure not how many wins a player would have added above some baseline, but how many pennants. James’ idea—which was not ultimately really correct—was that Pennants Added would give high-peak players extra (but deserved) credit for concentrating their greatness over a few seasons rather than a long, steady, but boring career. So what does this graph mean? That’s a fair question. 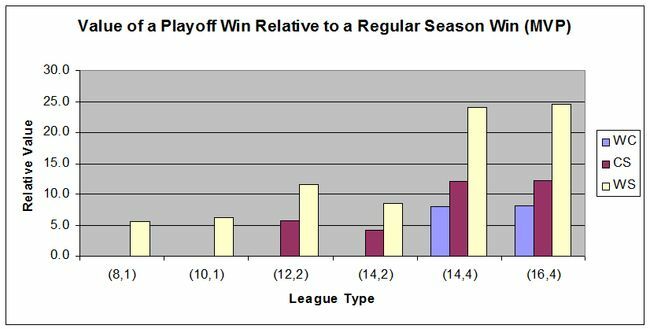 Essentially, the horizontal axis gives us different wins above replacement levels (a handy reference is that two wins is an average player, five is an All-Star, and eight is an MVP), while the vertical axis tells us how many World Series they would add to a randomly selected team (you should read both my Pennants Added articles if you want to better understand the exact process I used). The main thing that can be gleaned from this graph is that the value of any given player, in terms of how much he can add to a randomly selected team’s odds of winning the World Series, has vastly decreased over time. An MVP player half-a-century ago could increase a randomly selected team’s odds of winning the World Series by 27 percent, while today, he would only up their odds by 6 percent. Obviously, the value of an elite player 50 years ago was much different from his value today. Or was it? Indulge me if you will, and let me do a little math. Specifically, let’s calculate the value of a great World Series performance—say, one win above replacement. 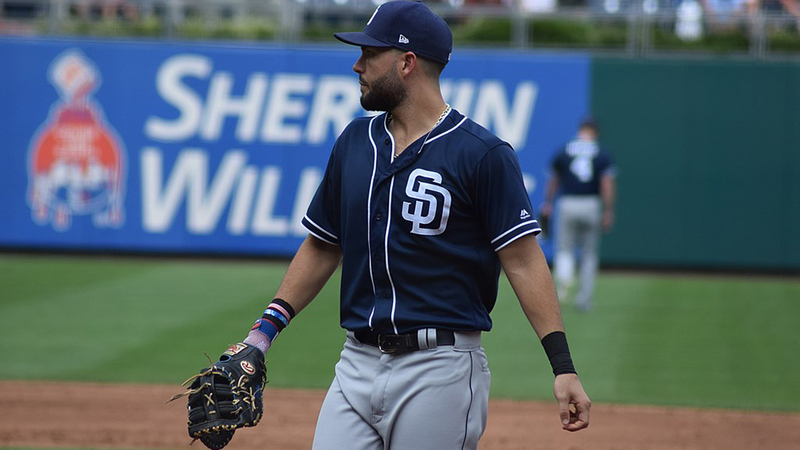 What is one win above replacement? It’s the equivalent to something like two starts of six shutout innings each. So by how much would a player raise his team’s probability of winning it all if he turned in two starts like that? Well, essentially, he would turn a series in which his team needed to win four games into one in which they (theoretically) needed to win three. (And by the way, for those who take issue with using replacement level here, it doesn’t really matter what level you use; the argument remains the same.) With a little math, we find that their odds of winning the Series improve from 50 percent (assuming an equal match-up, and ignoring things like home field advantage) to 68.75 percent. In other words, that player would be worth .1875 World Series victories—not too bad. Now this number is the same no matter what era you look at. There are, however, two confounding factors: The introduction of the League Championship Series and subsequently the divisional round, and the relative value of a playoff win to a regular season win. We’ll first tackle the former. 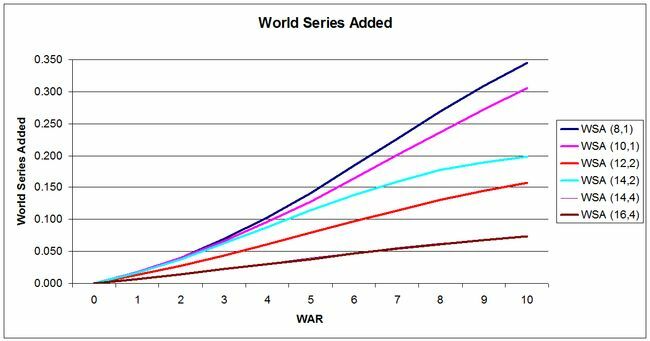 The math for the League Championship Series is much the same as the math for the World Series; the only difference is that winning the LCS only gives a team a 50 percent shot at winning the World Series, so a player who is one win above replacement (or whatever baseline you choose) in the LCS is worth not .1875 World Series Added, but .094 (rounded). In the divisional round, you only need to win three games, so the value of one win is a little more—it increases the team’s odds of advancing by 25 percent—but of course, now we need to divide the number not by two but by four, so a player who is one win above replacement in a divisional series is actually worth .0625 World Series Added. So the first conclusion we can make is that modern players have a lot more chances to contribute in the playoffs than did players from previous eras. The (realistic) potential value of a player who stars throughout the playoffs is twice what it was 50 years ago. Whether that makes up for their regular season disadvantage, we’ll look into at a later date. What I want to address right now is of more pressing importance. What I want to address right now is the great increase in the relative value of playoff contributions to regular season contributions. A player who contributed 10 wins above replacement in the regular season 50 years ago would have .345 World Series Added. If he continued on the same pace in the playoffs (assuming all series go the distance), he would tack on .085, for a total of .43 World Series Added. A player who contributes 10 wins above replacement in the regular season these days gets just .073 World Series Added. If he continues on that pace in the playoffs, he ends up with .20 more, for a total of .273. What this graph tells you is that while a win in the World Series 50 years ago had about five times the value of a regular season win, today its relative value is 25 times greater! The relative value of a win in the League Championship Series is 12 times greater, and even for the divisional round, it’s eight. In other words, relative to a regular season win, one win in the divisional round has a greater value than one win in the World Series win did half-a-century ago! Crazy. Since the values change depending on just how good a player is, let’s take a look at the graph for an All-Star level player (five wins above replacement). The story here is much the same, the only real difference being that in the eight and ten team leagues, the relative value of a World Series win for an All-Star would be about seven-to-eight times greater than the value of a regular season win. 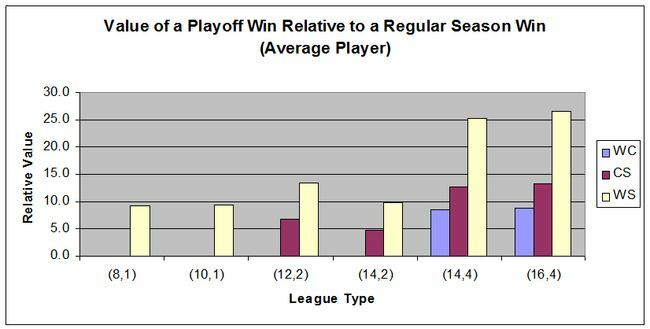 For posterity’s sake, here is the graph for an average player (two wins above replacement). Again, the relative value of a World Series win in older years rises, but still is far below what we see today. 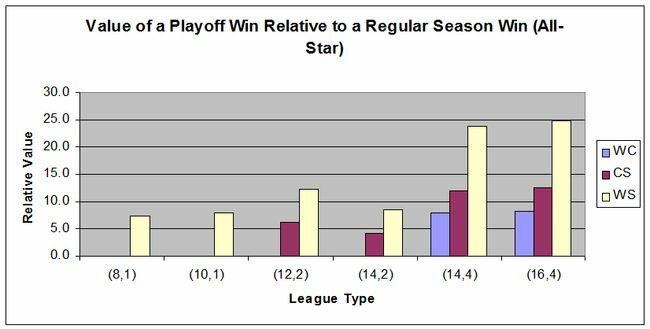 The pattern is clear: A great playoff performance in 2008 is worth tons more, relative to a great regular season, than a great playoff performance in 1958! The implications are potentially staggering. For example, what if we evaluated every player’s statistics in a modern context, giving World Series performances 25 times the weight of regular season games? Would Curt Schilling end up the greatest player of all-time? For those interested in those types of questions, I think this is a really important point to digest. There’s a lot that can be said about this, and probably some things I didn’t think of, so if you have any thoughts you’d like to share, feel free to e-mail me. Let’s figure this thing out together.